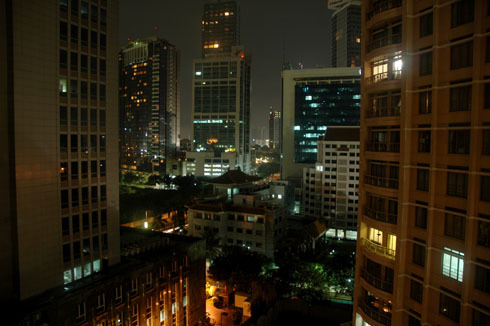 The outside-world impression of Jakarta would be that of a trouble-prone, poor city struggling to cope up with poverty and terrorism. After having visited Jakarta twice in the last one month, i realised that this image is not exactly true. Yes, the poverty is very much visible in the streets off the main roads and the fear of terrorist attacks looms large, but Jakarta is not what you expect from a muslim country. 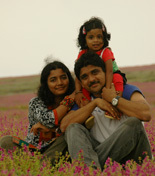 It is vibrant, open and the nightlife is comparable, if not better than India! The people are extremely courteous and welcoming and the city makes you want to return! 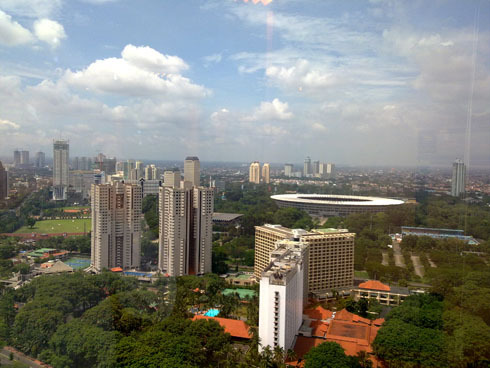 The business centre in Jakarta resembles any american downtown with skyscrapers and starbucks wherever you look. There are dozens of malls around the city. Taman Angrek is supposed to be the biggest mall in Asia. The good thing is that you have all kinds of malls, ranging from the super pricey ones (with 2000 USD Louis Vitton Handbags) to the bargain shops. 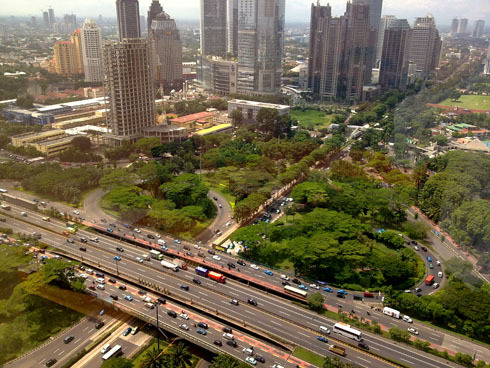 The first 2 photos are taken from the 39th floor of one of the business towers in Jakarta. They seem to have left quite a few trees around. Maybe some enlightened guy is regulating urban planning there. Next story Family Photo: Then and Now.